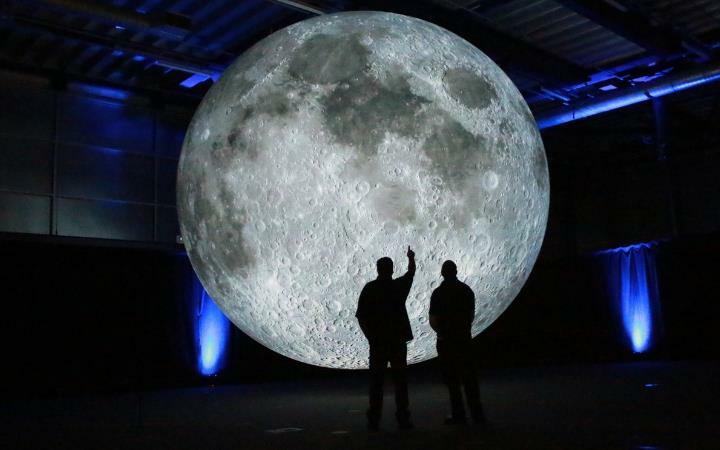 Artist Luke Jerram’s enormous Moon was created using detailed NASA imagery of the lunar surface with an approximate scale of 1:500,000 – each centimetre of the 7 metre spherical sculpture represents 5 kilometres of the moon’s surface! The internally lit installation gives visitors a surreal up-close experience by fusing lunar imagery and moonlight with a surround sound composition by BAFTA and Ivor Novello award-winner Dan Jones. Over the centuries, the moon has been interpreted as a god and as a planet, been used as a timekeeper, calendar and to aid night time navigation, and inspired artists, poets, scientists, writers and musicians the world over. Museum of the Moon allows us to observe our own interpretations of the moon and its place in our world, contemplate the various beliefs and mythologies surrounding the moon, and consider the latest moon science. On Friday 22 February, 4.30-5.30pm, enjoy a 'Gong Bath' underneath the Moon - a tension releasing, stress relieving sound message for the soul. Simply lie down and immerse yourself in the sound of gongs and other sacred instruments. No booking required. Booking: Not required, just come along! This event is part of the 2019 Suffolk Science Festival run by Kinetic Science. Please click here for more information. Co-commissioned by a number of creative organisations brought together by Luke Jerram and Norfolk & Norwich Festival. These include: At-Bristol, Kimmel Center, Lakes Alive, Provincial Domain Dommelhof, Brighton Festival, Greenwich+Docklands International Festival, Without Walls, Les Tombées de la Nuit, Rennes and Cork Midsummer Festival. The artwork has also been created in partnership with the UK Space Agency, University of Bristol and The Association for Science and Discovery Centres.